FREE! All natural bug repellent! From the leading experts…. Horses don’t lie, right? So this one has to be true. Popcorn told me so! When covered in mud the flies are naturally repelled. Don’t belive me? When the flies were driving my old horse (19 yrs) Scrapper CRAZY I went into the pasture near the recently emptied water trough and painted him with mud over his rear where he must be extra tasty-look at the size of that biting fly! But he couldn’t get through the mud. I am thinking of creating a big mud spot in the turnouts and seeing what the horses do with it. What do you use for defense against flies in the summer? Well, I’m wondering if I should put watered mud or Skin so soft recepie into my bottle!?! But I sure want to buy the Stacy’s Stay Away spray if you find the “real good” mixe on day… maybe mud mixed up with Skin so soft!!! who wants to try??? Thankfully there isn’t much of a bug problem where I live. 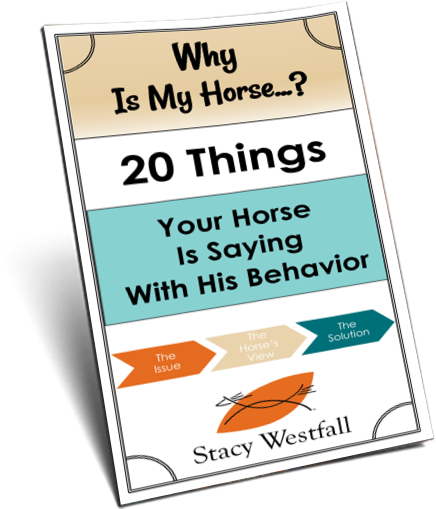 Just face flies, and I just rub some fly spray around my horse’s eyes because she has black around them and that’s the only place the flies really hang out. I think the mud thing is a good idea, however as an owner of a very white horse, I will never condone her rolling. Haha. Given the terrible drought that we have been having all over Canada and our friends to the south, there isn’t much mud if any to find and the heat has been brutal……So my poor spoiled boys are in during the day with fans blowing on them of course and I go out and hose them off to cool them down of course and they go out during the night. They seem quite happy out there during night but by 9 am at the very latest they are letting me know that it is time to come in out of the flies. They are very happy to be in the barn during the day no matter how hot it is. Sometimes the water troughs are dumped out for cleaning which creates the horses their mmud puddle! I think Patricia has A GREAT idea & I love the name – “Stacy’s Stay Away”!! Ya know – your loyal readers & followers would definitely buy it – especially here in IN where the drought has almost removed any thought of mud puddles!!! Go For It – Stacy!!! Well I tried making a mud puddle for Chloe, we’ll see if Chloe comes back in covered after a night out with the girls. I think Popcorn is just really a smart horse! Stacy…I just thought of a GREAT IDEA!!! How about if you get a hold of a company that makes horse body products and come up with a special FLY-AWAY-PRODUCT using purified mud as the main base mixed with other horse-safe chemicals so that horse owners can buy it in huge barrel sizes with a few nice starter brushes. This would be ideal for the owners who don’t want to have a muddy spot in the pasture, I know it’s possible because just think of the thousands of products we already use for household insects, so why not make a new one for horses made from MUD!! how cool is that?? Naturally you would have to give it a name….STACY’S STAY-AWAY!! just a thought, but I thought you might get a kick out it. haha! well we use what i call fly hats (I guess they’re really called “ear covers”) are really nice while trail riding on bad bug days. 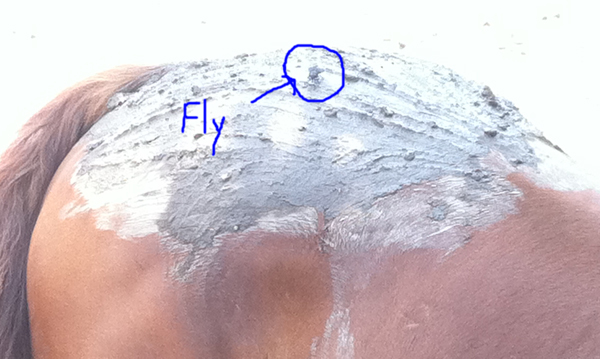 Around the barn we use fly masks and just fly repellent. absorbine or pyranha are the brands we use usually. However most of the time the most efficient way is our bare hands! nothin like slappin a big bomber off your horse’s belly. Now I feed my horses garlic and use my own spray of :skin so soft apple cider vinegar and water . I make a natural fly spray using: equal parts apple cider vinegar and water, 2 c. Avon Skin So Soft, 50 drops of citronella oil, and 25 drops of eucalyptus oil. This fly spray is non toxic, and natural. I don’t like to use the conventional fly sprays because I want to keep my animals healthy. Well Stacy this year I have decided, that there isn’t anything around to keep those little suckers from hanging around. So I have gone the more traditional method and that is a lawn chair, sunscreen and a shotgun. 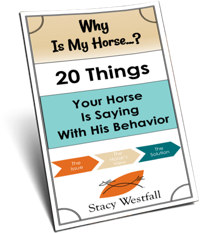 My horses are loose in abt 13 acres of pasture with a pond most of the time. They can stand in the shed or find some mud by the pond. Some horses will go swimming and others will roll in the shallow parts of the pond. Mostly they prefer to stand together in the shed. I don’t know why but the bitting flies don’t seem to go in there. Anyone know why? There are flies in the shed but they seem to be manure ones and not bitting ones. The horses don’t seem to mind thoes flies. The face flies don’t go in there either. So the horses can stand in the shade with a breaze and be mostly free of flies in the middle part of the day. Then they go out in the evening and eat grass during the night when there are fewer bugs and it is cooler. I ride in the evening or early morning. Pyranha! I have found that the aerosol seems to work better than the pump. Strangely, I’m into natural products, but, I use the most powerful (and toxic?) fly spray I can find. 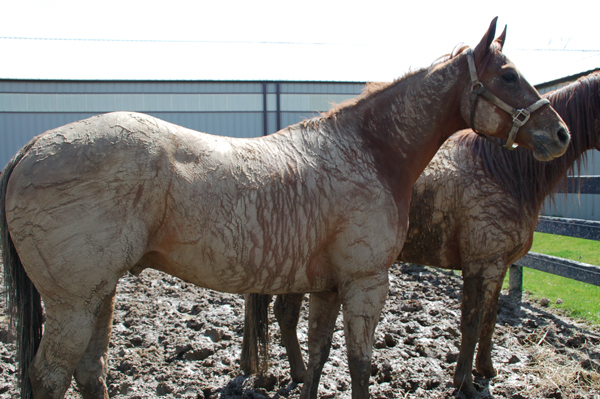 I’d be willing to make a mud hole for my horses. I would love to cut down on my environmental footprint, and fly spray expenses!